This is now my new favorite way to have cauliflower. Usually the family wants it dripping in Hollandaise Sauce so I think they were all a little skeptical when I said I was roasting it and there would be NO sauce in sight. As you can imagine this was met with some sour faces but all is now well. Pretty quick. Definitely delicious. Try this. note: I have made this a few times and used both Parmesan cheese and Pecorino cheese. I actually think I prefer the Pecorino. 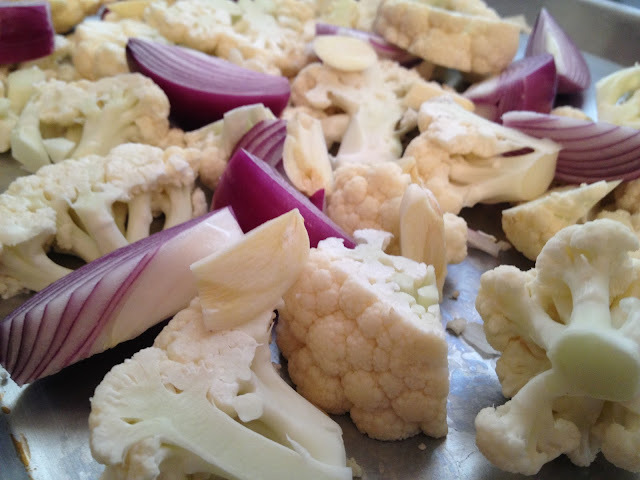 Chop the cauliflower into thick slices or chunks. Toss all that onto a baking sheet. Add a little salt and pepper - easy here because the parmesan cheese is pretty salty already. Just use your hands and make sure everything is covered. Maybe add another tablespoon of olive oil if you feel it's necessary. Add 4 or 5 of the thyme sprigs. Into the oven for 20 minutes. Remove from the oven - carefully give it a stir. Grate some fresh parmesan all over the vegetables. Back into the oven for 20 minutes - or until vegetables are tender. Add some fresh grated pepper. Taste for salt and add as needed. Love this stuff! I make roasted cauliflower all the time. I like to use olive oil, cumin, curry powder, cayenne and S+ P. Then zap it with some lemon juice when it's done. Love how it tastes, not so much how it makes my entire house smell like an Indian restaurant. ;) Roasted cauliflower is so healthy though and it makes you feel really full, which is good! Will need to try your version soon Ally. Sounds delicious! That looks sooo good! Never thought to roast chunks of garlic, bet they'd be good on bread. Definitely have to try it. YES Guavarose - the little chunks of garlic are so good with bread.